What are the best dog training techniques? 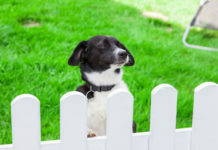 What are the different types of dog training? What are some puppy training methods? When do you start training a puppy? The day that puppy comes home for the first time is a big day for the whole family, or when that rescue dog finally gets to move out of the shelter and in with his or her forever people. It takes preparation before bringing a dog home to live with you; there are supplies to get, decisions to make (where should he sleep?) and behavioral challenges to prepare for. Luckily, we live in a time where tips and tricks for how to make the best out of life with a dog are readily available, and what better way to learn than through a book that was written by an expert? A lot of people get their information off the internet nowadays, but few things compare to the classic – a book. A carefully written dog obedience training book can both prepare you for those days of being a dog owner and help you understand and correct behaviors once the pup is already there. Let’s be honest here; how many of us haven’t tried to study and read information on the internet, but instead, we have ended up on Facebook? Let’s not go down that road. Instead, invest in your dog and in the potential of succeeding with him or her, by looking through the wide selection of dog training books online, and order the one that best suits your needs. Let’s have a look at a few good options. In the middle of potty training? 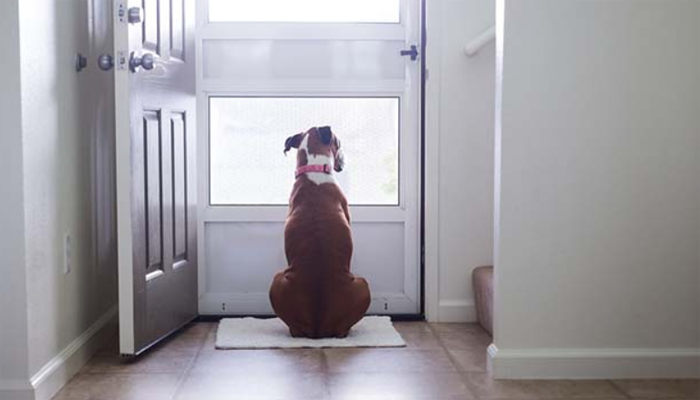 Consider a doorbell to train your dog to go outside for potty breaks! This book full of dog training tips was originally published as “The Love That Dog Training Program,” but changed the name when released in paperback and for Kindle. 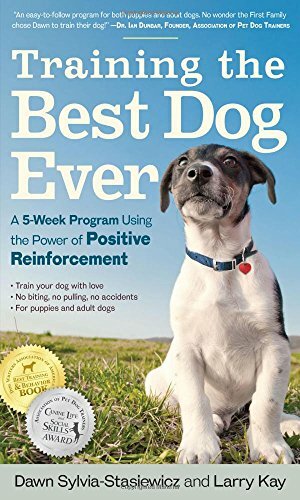 The book shares the power of positive reinforcement program with the reader, which was applied by the author to train the former President dog Bo Obama, as well as all of Senator Ted Kennedy’s dogs, and many others. This is a 5-week program, with a 10 to 20-minute training session each day. It is manageable even for the busiest of dog owners. Practical step-by-step images illustrate how to teach your pouch regular commands like sit, stay and come here, and how to help your dog learn where he can- and cannot pee, learn to love dog crates methods and more, making this one of the best dog training books currently on the market. Why We Liked It – One of the hardest things about getting your puppy is to know where to start, and this top dog training book offers a full course 5-week program – easy to follow from the beginning and to end. The best dog training guide is one that you can adapt to your needs, which is definitely the case here. 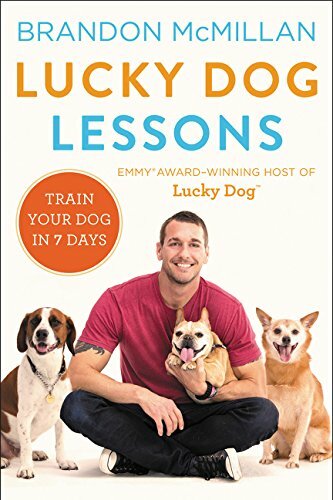 Written by the CBS show Lucky Star’s very own Brandon McMillan – an Emmy-winning celebrity dog trainer, this how to train your dog book is a great choice for anyone looking for some help with their furry friend. On his show, Brandon steps in to help troubled shelter dogs that are having difficulties finding a home, and he rehabilitates them by building trust, showing love and teaching them how to act properly around people and other animals. The idea of this dog training manual is the same, where all the experience gained through hundreds of rescues is shared with the reader. You get to learn how to build trust, how to work with your dog in a way that is fun both for you and the dog, how to teach all the most common dog commands, the power of positive dog training and how to create that unbreakable and life-long bond with your dog. As a plus; inspirational rescue stories are shared throughout the pages, and who could resist something like that? It sets it apart from many other dog obedience books. Why We Liked It – When looking for dog training books, it is nice to find one written by a proven expert, someone who has been awarded for his work hopeless cases – dogs that might have never found a home otherwise. It is also great to see positive reinforcement training used and encouraged also for more difficult dogs and situations. Zak George is a well-known Youtuber in the world of dog training, and he has also appeared with his own dog training show on Animal Planet. He, who is the writer of this book, has dedicated himself to provide dog lovers with an alternative dog training strategy, entirely built around positive reinforcement. Where more traditional dog trainers like Cesar Millan talk about the need to show authority and be the “pack leader,” Zak George and his methods are all about mutual respect, understanding, and teamwork. 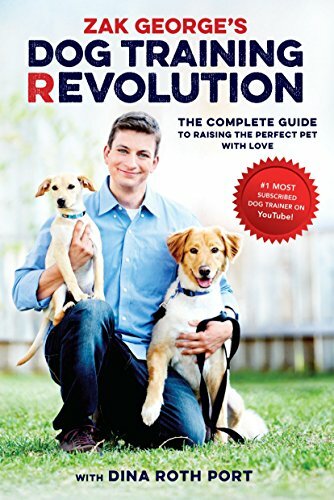 In Zak George’s Dog Training Revolution The Complete Guide, the reader gets tips and ideas for how to pick the right puppy for the family, how to housetrain and teach basic commands, how to deal with behavioral issues such as barking, for aggressive chewing and aggression, fun things to do with your dog and a lot more. Most topics have corresponding Youtube videos available for a more complete training experience. When looking for positive reinforcement dog training books, you will have hit the mark with this one. Why We Liked It – As a responsible dog owner you want a good relationship and a strong bond with your dog, and this is a book which focuses entirely on having fun together, with the necessary mutual respect where no pack leader is needed. Famous dog trainer Cesar Millan’s book revolves around dog psychology. It is a summary of his expertise in dog behavior and brings up subjects such as how to relate to your dog on a canine behavior level, the difference between punishment and discipline, how to use the dog’s pack instinct to form a strong bond and how to choose a dog that is right for your family. Why We Liked It – There is a lot of debate regarding what dog training method to use, but regardless of how you feel about the methods of Cesar Millan – there is no doubt that he has a unique understanding of the dog as a species. This is not a Cesar Millan puppy training book or a Cesar Millan training book to help you teach your dog tricks, but instead it is a book that allows you to begin the process of fully understanding your four-legged friend, and it is when we understand our canine companions that we can find solutions to problems and give them what they need. When looking for the best books on dog training, you might want a book that tells you what to do, why you should be doing it and when to do it. If that sounds like you, this might be the best dog training book you can find. Its content is split into three parts; with the first being educational, the second part a hands-on plan for what to teach and how to teach it, and with the third part revolving around problem solving. The author runs an online dog training school, has over 35 years of experience working with dogs and has won many awards in dog obedience competitions. She is known for her gentle methods and loving approach, which is something you want to look for when shopping for dog training books best suited for you and your pup. Dog training should always be fun, which it can be with this comprehensive and complete training guide. 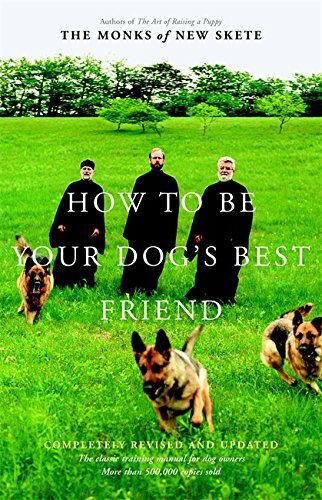 This classic training book among dog obedience training books has been around for a while and is written by the Monks of New Skete; who have been training dogs for over 30 years. Half of the book is a training guide for how to teach your dog basic commands, and with ideas for a solid feeding routine, behavior recommendations, grooming tips and much more. The other half is a philosophical reflection of the mental benefits that come with sharing your home with a dog. The book was first released in 1978 and has been continuously updated since, to fit modern standards and views when it comes to dog training. When looking for the best puppy training book, this could be a good choice as it helps you find the right mindset already before bringing your furry family member home. Why We Liked It – Finding the best dog training book can be hard, but this one makes a strong candidate due to its unique approach in teaching a dog owner the benefits of having a dog. It can help balance the training, teach patience and make it seem worth it even on days when you find yourself struggling to be the perfect pet parent. The right mindset is key when building a strong foundation, making this one of the best puppy raising books for a new dog owner to keep on the shelf. Here is another Cesar Millan dog training book, meant to help the amateur dog owner with a professional approach to dog health, and a healthy dog-and-owner relationship. You get to learn how to satisfy the needs of the dog based on their own dog breeds, how to use calm-assertive energy to deal with both your own dogs as well as with dogs and people around you and how to tackle common dog behavior problems. Melatonin can also help to calm your dog. 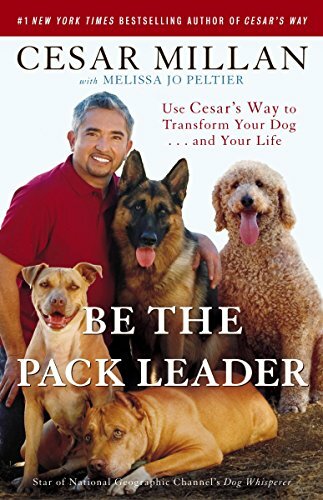 This Cesar dog training manual is filled with techniques and practical suggestions for how to approach dog training, and it also includes several success stories from Cesar Millan’s own career as a dog trainer and dog psychologist. 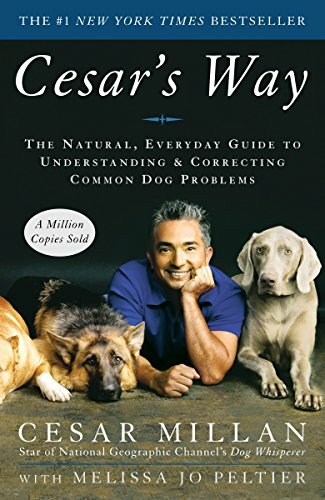 Why We Liked It – Cesar Millan har proven to be a force to be reckoned with in the dog training industry, and also as an author of books on how to train your dog. This book cuts straight to the chase, which we like, pulling the reader into a step-by-step type text to teach you how to find balance when training your best friend. Here we have a small half-hidden pearl in the sea of books on training dogs. There are so many different dog training approaches nowadays, and as a new dog owner, it can be difficult to know which out of hundreds of perfect puppy training books to get. 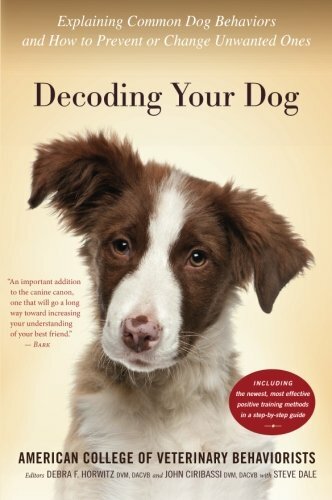 Decoding Your Dog takes a look at several of these training methods, giving an easy overview of what there is out here, and how each one works. While the book comes with expert advice, it is written in a way that can be read and enjoyed by anyone. The positive training book is also full of advice from various trainers and covers subjects such as rewards, training treats, punishments, dog supplies like leashes, collars, canine harnesses and electric training collars, simple dog training tips and more. It is a very complete guide to what the world of dog training has to offer. This positive approach training book features all the latest veterinary approved training methods, and when training dogs books are a great asset for expanded knowledge! Why We Liked It – It is not hard to understand why this positive approach training book places among the best books for dog training, as it offers tips from more than just one dog trainer. This Beginners guide to dog training makes it possible for you as a dog owner to find a training method you feel comfortable with and continue researching from there. It is a great introduction for new dog owners. When browsing through the best puppy training books, you are likely to come across this one at some point. It is another classic training book, also written by the Monks of New Skete, who offer their over 30 years of experience to help dog owners and pet parents find a training method that works. 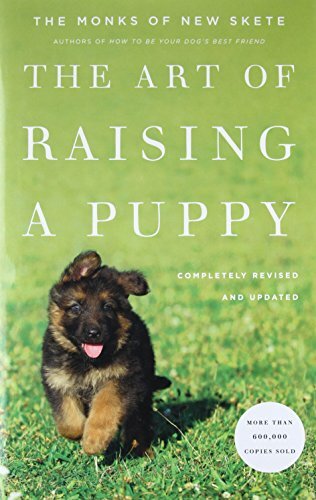 Considered one of the best puppy books for quite some time now, this guide to raising the perfect pet is the latest and updated version, full of tips for how to choose a puppy, whether to adopt or buy, how to crate train and how to teach basic commands. The continuous updates of The Art of Raising a Puppy to help you stay up to date with the latest, because even if you bought the best puppy training book 2015 had to offer, or any other year, dog training is constantly evolving and changing, so it might be time for an update. Books on dog training is a great way to connect with your dog and to learn how to handle different situations that might occur. Another great thing to do with your dog is to learn tricks! This step-by-step guide and training manual provides step-by-step instructions for how to teach your dog fun tricks, like how to sit, lie down, stay, do a high five, roll over and much more. Not all tricks are useful when educating your dog, but they can be great fun and surprising party tricks for friends and family. Teaching tricks help create a bond with your dog, as you learn to work together and trust one another, which can be useful also when working with problem behaviors. 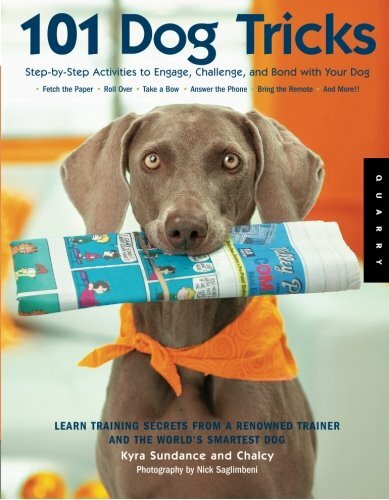 Looking for the best book for dog training doesn’t always have to mean finding a book to deal with problems, but it could also be a book like this step-by-step guide and training manual – designed for having fun and learning together. You even get to learn how to teach your dog to get a beer from the fridge! Why We Liked It – The best dog training books are those offering something different, and this book shows you how to teach your dog some tricks that are guaranteed to impress friends and family! Pet training books come in all forms and shapes, and this one is aimed at a dog loving owner who wants to have fun with their dog. A great way to find good books about dog training is by looking through reliable dog training book reviews, but it is also important to know what it is that you are hoping to learn. Start preparing already before buying or adopting a dog, regardless of whether you are going for a puppy or an adult pup. Find the best books for puppy training, the best book on dog training for adults and rescues or whatever you may needing. So, what is the best dog training book? Being a book written by someone hired to train dogs at the White House, Training the Best Dog Ever is a safe bet when it comes to quality reading. The training programs explained will only take up 10-20 minutes of your day, which is manageable for most. It is important that animal training books are easy to read and comprehend, and this one features illustrations to guide you every step of the way. 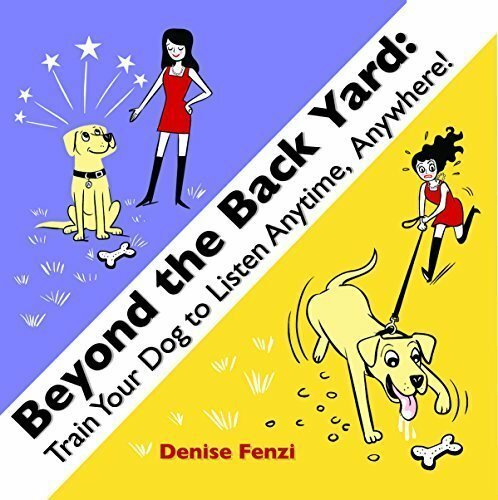 It is one of the most recommended dog training books currently available, and one of many great books for dog trainers and hobby trainers alike. In the wide selection of dog information books – Lucky Dog Lessons stands out. It is often mentioned in puppy training book reviews, as one of the top rated puppy training books, due to its gentle methods and approach built on love and respect. It is one of the best books on puppy training, but the methods are suitable for canine companions of all ages; both rescues and those bought from a responsible breeder. For that avidly searching fort training advice on video platforms like Youtube – Zak George and his Dog Training Revolution is nothing new. He has been around for quite some time, offering methods with a focus on teamwork and trust, rather than pack leaders and followers. This books only costs around $10, making it a very economic quality choice for anyone who is interested in training together with their dog, and becoming stronger as a team. 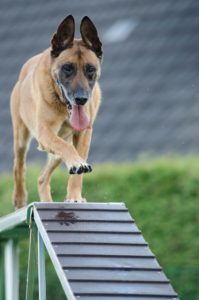 It is hard to point out one technique as being the best, which becomes clear when reading books about training dogs. There are so many methods out there; and there is no one-method-fits-all. Instead, everyone needs to take themselves the time to read and learn, and then make an educated decision on what ways of training a dog that fits you. Dog training should never be based on punishment or harsh acts, but some prefer a more authority-based style, while others just want to have fun without having to feel they need to boss over their dog. All training dog books mentioned above present humane training techniques, with no fear based methods or punishments, so no matter what you choose – you are choosing a good thing for your dog, which will come to strengthen the relationship you have with your pet. As long as the training is based on positive reinforcement, you have good chances of succeeding. Clicker training is another recommended method. There are many different types of training you can do with your dog. There is obedience training, to help your dog know how to act in certain situations, canine behavior training to help correct unwanted behaviors, a guide to dog agility for fun and exercise, different forms of tracking and much more. 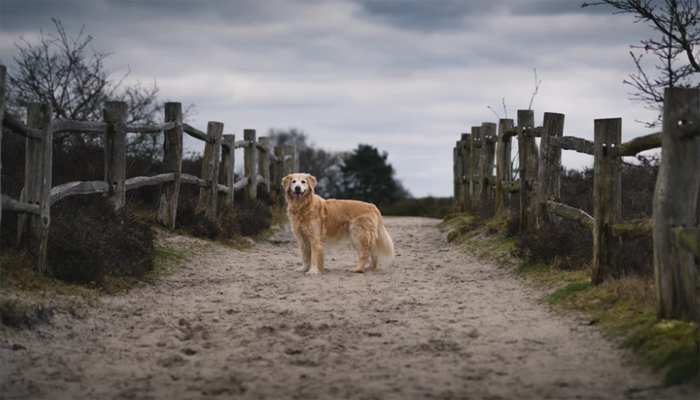 Finding the best dog behavior books is key to dog health and a happy, healthy dog/owner relationship, but training can be so much more than just behavior and obedience based. 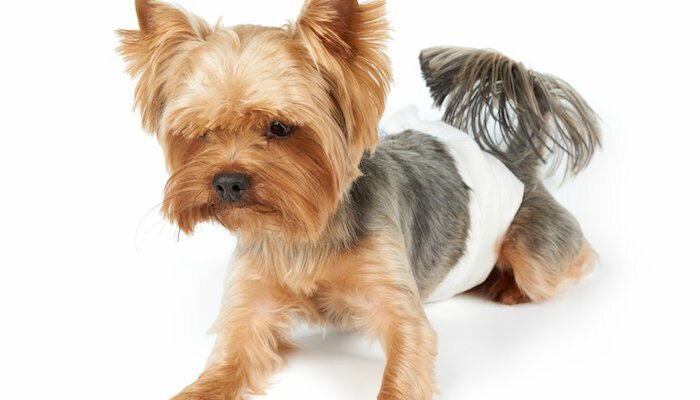 Looking through top puppy training books, you quickly realize that you can often use the same methods with puppies as you would with an adult dog. Clicker training is a great way to get started, and puppies will quickly learn to associate the click with the wanted canine behavior. The earlier you start working with your dog, the quicker he or she will learn what you require of them. Puppies are incredibly intelligent, so use a clicker and positive reinforcement, and train in short intervals not to tire them out too much, and you will quickly be noticing results. A puppy can start its training as soon as it moves in with you, but it is important to know how to go about it, which is something a book can help you with. The puppy training books best suited for your needs are those that carefully explain what you can train with your puppy, at what age certain training is suitable and how often you should be training. 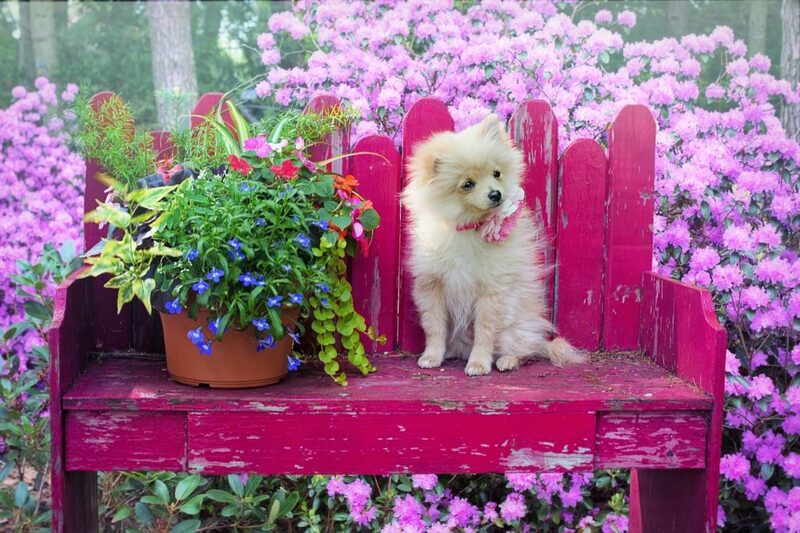 Some small things can begin to be taught already from the start, and others might require the puppy to be a bit older. This is the purpose of dog trainer books – to help you know how to train and when to do it. We have covered some of the best positive dog training books here, to give you an idea of what to look for and how to find the right one for you. Think about what it is that you need, what you would like your dog to learn or what you hope to work with, and then choose between some of the best books on training dogs that there are. Dog training should be fun and a challenge both for owner and dog, so look at it as a learning experience, and get out there and grow together as your dogs best friend. Try not to get frustrated when training, because your dog will sense your frustration and become difficult to work with. Have fun with training instead and soak up the expert tips from the authors of the above books for maximum results. 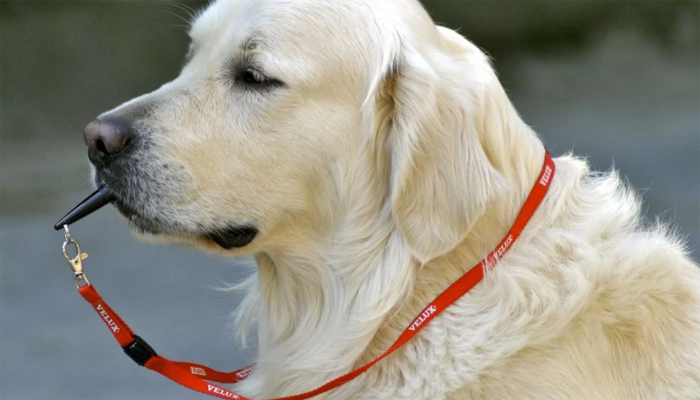 Experts claim that an intelligent dog is capable of learning around 165 words, but they are also great at memorizing the meaning of hand signs and body language. Read more about the psychology of dogs here.